Middlesex University needed a more efficient way to deal with the huge increase in enquiries it faces each year during clearing. So, we designed a chatbot that came to its rescue. The Admissions team at Middlesex University is small and close-knit, but every year they faced an onslaught during the clearing period (July to October). They struggled to keep up with the huge numbers of clearing applications they received and needed a way to help them funnel and respond to each one. The team had already looked into the possibility of adding a chatbot to the website to do just that, but didn’t know how to make it happen. The other element was a tight timeframe; the University needed a first version within one week, with just three days for modifications. 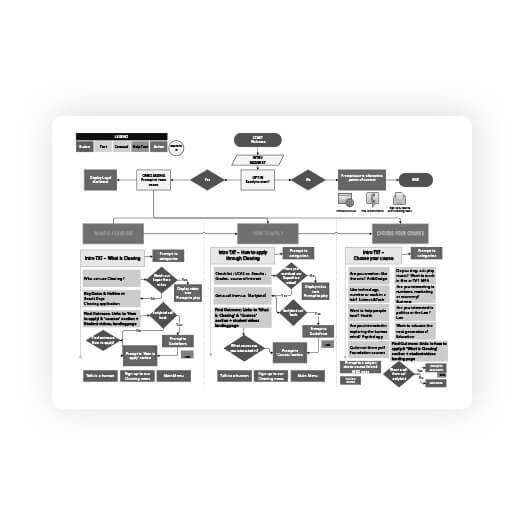 Middlesex University had already worked on a number of example chatbot user flows, so we began by examining these to pinpoint the exact outcome each one needed to achieve. It was a collaborative project with the University team – we worked closely alongside them to get the rapid results they needed. We redrafted the user flows and, as the team wasn’t sure whether or not to host the chatbot on the University Facebook account, we helped pinpoint the most suitable hosting platforms for the bot. Next was an intensive period of compatibility testing – ensuring that the bot would run smoothly across each of these platforms – and ironing out any problems we encountered. We launched the chatbot right on schedule and kept an eye on it while it was live, refining it further as it went. The chatbot remained live on the University website until the end of clearing 2017, designed to latch on to any search term around ‘clearing’, fielding them and pointing prospective students in the direction of the right information. It acted as an extra member of the Admissions team, manning these queries 24/7 and freeing the team themselves to tackle more demanding work. Middlesex now has a tailored chatbot it can implement on its website every year as clearing approaches, easing the administrative burden of this annual concentration of activity. Vertical Leap delivered a working chatbot in a very short amount of time – and it did the job very well!